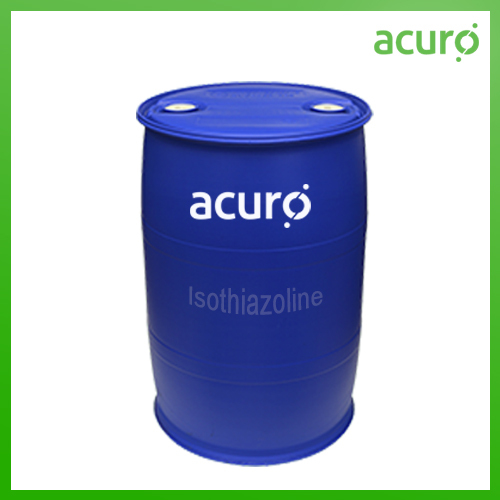 Isothiazolinones are broad-spectrum, non-oxidizing biocides that can be used in a wide range of industrial applications. The product formulation helps to inhibit the growth of microbes and has inhibition and biocidal effects on most of the common bacteria, fungi and algae found in water. ACURO Water Treatment is able to provide a wide range of Isothiazolinones, including Chloromethylisothiazolinones and Methylisothiazolinones (CMIT/MIT) solutions. Isothiazolin is harmful or fatal if swallowed or absorbed through the skin.If ingested, drink several glasses of water and induce vomiting. Get immediate medical Attention. Contact with eyes causes severe irritation or burns. If eyes are contacted, immediately flush with clear water for 15 minutes and then get medical attention. Product can be absorbed through the skin and can be fatal. If skin is contacted, immediately wash with soap and water. Change and launder contaminated clothing before reuse. The use of goggles or face shield and rubber gloves when handling this product is recommended.